1. Open the manu->Setting->BT->open the Bluetooth. ★BEST CHOICE★ TOUMEI portable projector is the same size with iPhone 8P, Weight only 0.58lb with a compact and portable Design easy to use. 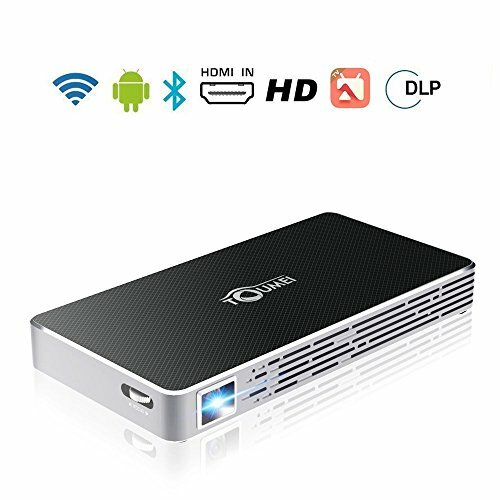 This portable projector is easy to carry,will not take up too much space.2.4G/5G WIFI connected to the network.The mini phone projector for iphone android offers a 34"-120" large projection screen size with projection distance 3ft-10ft.Support HDMI input to laptop, Game host, TV box, Support external Bluetooth Speaker. ★WIDELY USED★This small video projector with automatic keystone correction.Using the mini beam projector to watch movie, play games, watch the game,hold a party(such as Halloween Party ), preside over a working meeting,etc.The portable projector can be used both indoor and outdoor .This portable projector is the best gift for family and friends(such as Easter Day gift).Built-in office app,Simple operation PPT, word, Excel. ★WARRANTY★1 year warranty.If there are any other problems with our portable video projector, please feel free to contact us.Support replacement.Customer service email is available in 24 hours, timely reply.If there is an exception on the same screen, you may need to upgrade happycast .Open Happycast it will automatically upgrade.If not,Manually upgrade,in the home page,use button on the remote control to enter the menu,choose the settings to select the version update. ★FEATURES★①The pico portable projector with both off-axis effect and trapezoidal function.②We choose to highlight H3S DLP light machine, you can enjoy a brighter picture, richer color, higher contrast(2000:1),mini dlp projector support 1080p. ③You can use the mobile power to charge and discharge（5V,2A),can easily endurance in outdoor.④The smart mini projector can connect to phone with the screen via hotspot,no routers and networks can also play movies and pictures in the phone. If you have any questions about this product by TOUMEI, contact us by completing and submitting the form below. If you are looking for a specif part number, please include it with your message.